Adam moisture analysers provide fast and efficient moisture analysis of a sample as an alternative to time-consuming oven testing methods. Moisture analysers (also called moisture balances) consist of both a weighing and heating component that utilises the loss-on-drying (LOD) principle to determine a percentage of moisture content within a sample. Analysers are not limited to one sample type and are often used in laboratories to weigh a wide range of organic materials including cosmetic creams and gels, soil and grain, dry pre-packed foods such as biscuits and more. Adam's PMB moisture analyser minimises the chance of burning the sample by using a halogen bulb to effectively heat and dry the sample while the weighing component accurately weighs the sample as it gives off moisture; reducing the testing period and providing greater measurement accuracy. The PMB can replace traditional oven testing and also the Karl Fischer titration method of analysing moisture. Adam's PMB moisture analyser features a built-in halogen heating bulb for fast and effective sample drying. 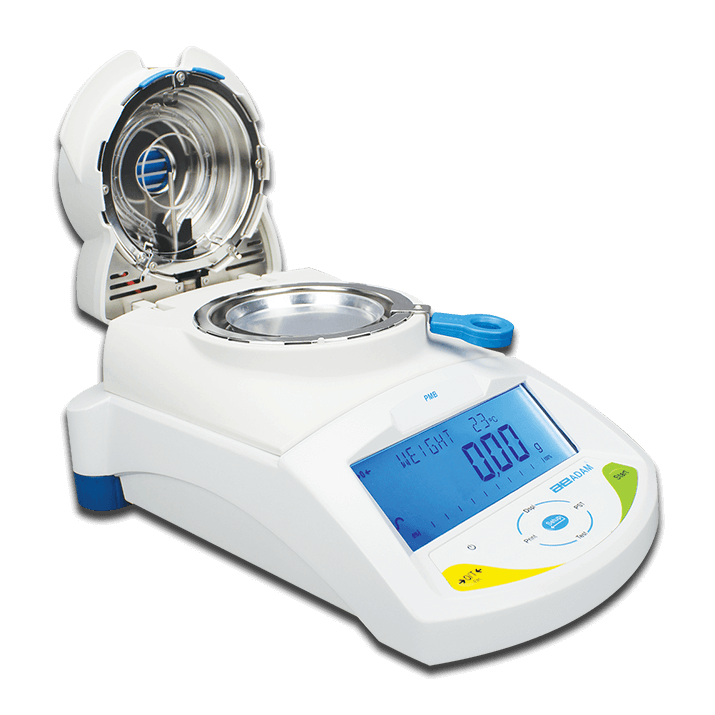 The PMB is used to determine moisture content in organic samples such as food, grain and cosmetics.